I thoroughly enjoy cajun & creole food – the food tends to be so full of flavor and comforting that it really jives with me. One of my favorite lunch spots in the downtown area, Fisherman’s Outlet, serves a seafood gumbo that I find almost irresistible. 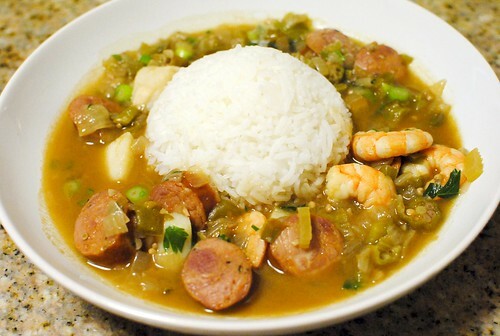 I finally decided to make a gumbo of my own, though it would be a bit different from the one at Fisherman’s Outlet. 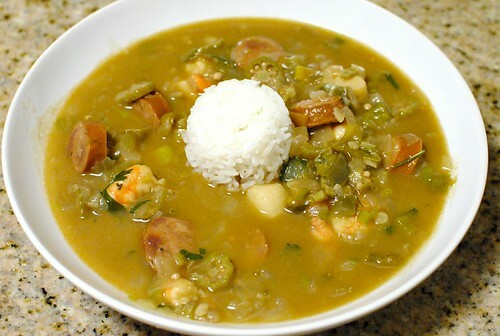 I decided to start with a more traditional recipe for a shrimp and sausage gumbo. This would be my first time making the dish and I’m pretty inexperienced with cooking in this part of the country; I’ve attempted making jambalaya a couple of times with mediocre success. I based my gumbo almost entirely on a recipe from America’s Test Kitchen; any substitutions were based on what I could find at the market. 1. Bring reserved shrimp shells and 4 1/2 cups water to boil in stockpot or large saucepan over medium-high heat. 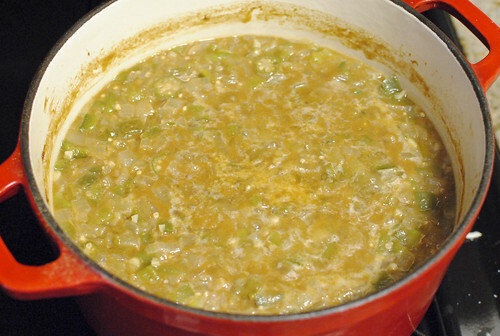 Reduce heat to medium-low; simmer 20 minutes. Strain stock and add clam juice and ice water (you should have about 2 quarts of tepid stock, 100 to 110 degrees); discard shells. Set stock mixture aside. 2. Heat oil in Dutch oven or large, heavy-bottomed sauce-pan over medium-high heat until it registers 200 degrees on an instant-read thermometer, 1 1/2 to 2 minutes. Reduce heat to medium and stir in flour gradually with wooden spatula or spoon, working out any small lumps. Continue stirring constantly, reaching into corners of pan, until mixture has a toasty aroma and is deep reddish brown, about the color of an old copper penny or between the colors of milk chocolate and dark chocolate, about 20 minutes. 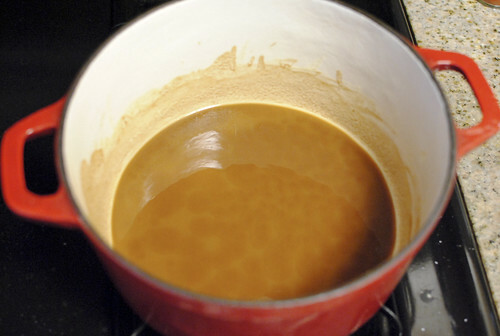 (The roux will thin as it cooks; if it begins to smoke, remove from heat and stir constantly to cool slightly.). 3. Add onion, bell pepper, celery, okra, garlic, thyme, salt, and cayenne; cook, stirring frequently, until vegetables soften, 10 to 15 minutes. Add 1 quart reserved stock mixture in slow, steady stream, stirring vigorously. Stir in remaining quart stock mixture. Increase heat to high; bring to boil. Reduce heat to medium-low, skim off foam on surface, about 30 minutes. 4. Stir in sausage; continue simmering to blend flavors, about 30 minutes longer. Stir in shrimp; simmer until cooked through, about 5 minutes longer. 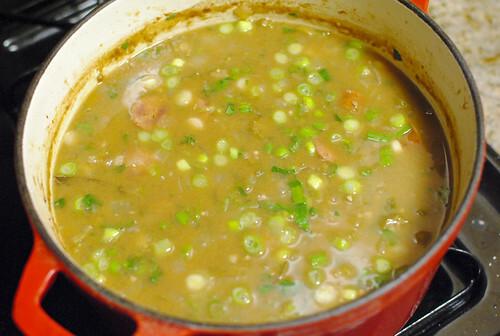 Off heat, stir in parsley and scallions, adjust seasonings to taste with salt, ground black pepper, and cayenne; serve (traditionally gumbo is served over white rice.). I followed the instructions step by step, first using my shrimp shells to fortify my shellfish stock (directly simmering the shells in a combination of the stock and water). I used stock from a carton; I wanted clam juice but wasn’t able to find it at the market. The roux was the part I was most concerned with since this was my first time making one and I feel like I’ve heard a ton about the importance of a quality roux. The longer it’s cooked, the less it acts as a thickening agent and the more it provides a deep, kind of nutty flavor. I cooked mine for about 40 minutes, stirring almost constantly until it reached a fairly deep chocolate color. The rest of the steps were rather straightforward, which included sweating the aromatics and adding the liquid to simmer. I next added the sausage and, after about 30 minutes, the shrimp. 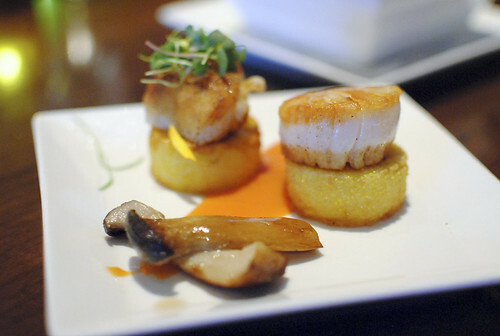 I actually had some sea scallops on hand, so I quartered them and dropped them in too. 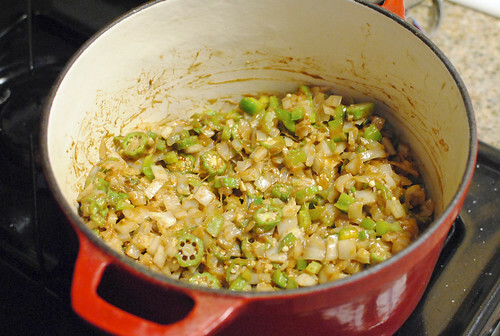 Lastly, off heat, I added the parsley and scallions. 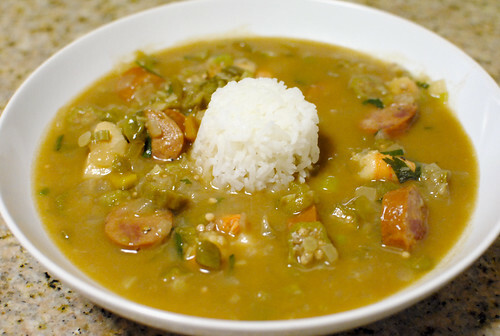 I scooped up some rice in the middle of a bowl and ladled the gumbo around it. My first plate had a bit too much rice – the starch can really soak up the soup so I’d recommend starting kind of small. Overall, I thought my gumbo turned out okay. I really have no idea if I executed the recipe the way it was supposed to, but I’d like to think I followed the directions pretty well. The andouille is key, providing much of the flavor; next time, I’m gonna try packing in the seafood. After dinner at The Fat Duck, my friend Shawn chose this lunch spot for my last meal in London before returning home. It seemed fitting to try one of Gordon Ramsay’s many restaurants during my stay, and this was one of the few open early enough to squeeze in a quick meal before my flight back to LA. 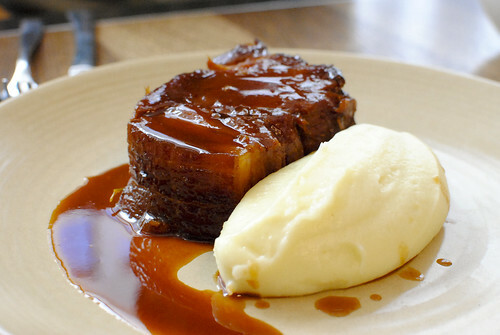 Ramsay has about a dozen restaurants in the UK and Bread Street Kitchen is his newest, opened in September of last year. 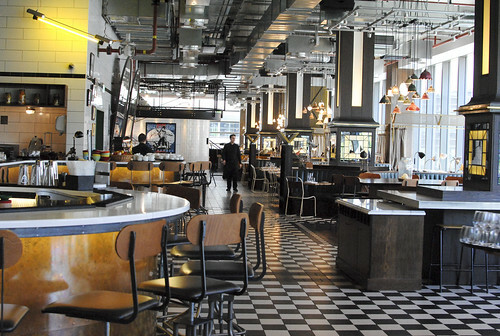 While he’s probably best known for his fine dining restaurants, Ramsay does have a number of more casual restaurants (including a pub) in his portfolio. 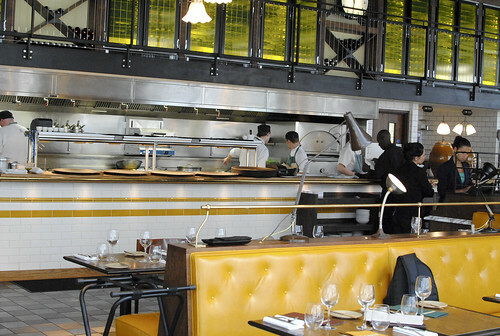 Bread Street kitchen falls into the latter category, with a menu that features a raw bar and items out of its wood-burning oven among a host of other options. It’s a pretty large space with floor-to-ceiling windows throughout and a long, open kitchen. 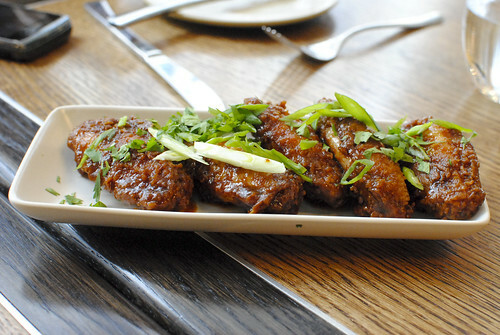 The wings were covered in a delicious sweet glaze, yet still held up a pretty crispy batter. The meat itself was juicy while the chopped onions provided a little bit of cool freshness to complete the bites. Well done. I’d have to say this large hunk of meat looked really appetizing as it came out. The pork itself was smoky and sweet, rich with a few gelatinous pockets. I’m not a big fan of the gelatinous part, but anyone who does would probably love this. 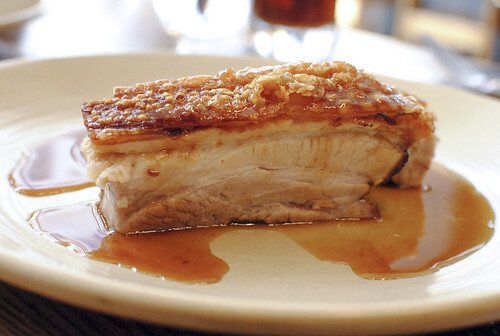 Another meaty dish, this was a generous chunk of pork belly – not too fatty. The skin was delightfully crispy, while apple sauce provided a sweet, fruity (albeit typical) accompaniment. I ordered this dish, wanting something a bit lighter. 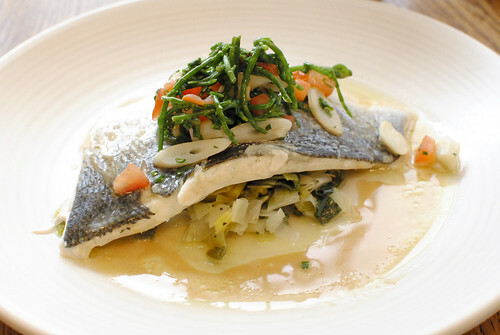 The fish was moist, complemented by light flavors of the leeks and a shellfish essence in the sauce. Little pieces of razor clam provided subtle chewy texture, while samphire (a plant I’ve never seen in the US, apparently indigenous to the UK) provided some earthy balance. We also ordered a few sides to go along with the entrees (all a la carte). They were good, albeit nothing special. I ordered the fries and liked how they came pretty thick-cut, crispy with a fluffy interior. Kind of reminded me of my grandmother’s french fries. We passed on dessert since we were a little short on time. Plus, we had Oddono’s gelato just before this meal so we kind of had dessert for breakfast. 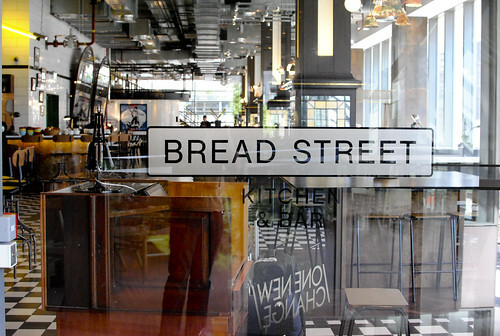 Bread Street Kitchen provided a casual atmosphere and simple, well-executed food. The food isn’t particularly unique but it isn’t trying to be. After the dinner the night before, it was a welcome sight to come back to something more comfortable. Next time though, I’m ready for Royal Hospital Road. I recently attended an extraordinary four-day wedding in India. On the way back, I wanted to capitalize on the fact that I was halfway around the world and stopover somewhere interesting to explore/eat. Options throughout Asia piqued my interest but my friend Shawn proposed that I visit him to spend a couple of days in London with the main reason being to dine at The Fat Duck. He’d been wanting to go but hadn’t had a chance to yet – I didn’t need much convincing. 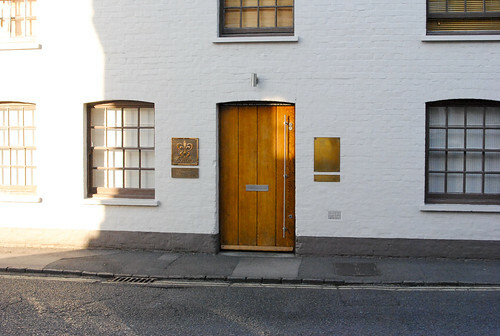 Opened in 1995, The Fat Duck has become a world-renowned destination (~30 miles outside London), having been bestowed 3 Michelin stars each year since 2004 and being named the best restaurant in the world in 2005 in one particular survey (it consistently held a spot in the top 5 until dropping to #13 in 2012). The chef, Heston Blumenthal, is known for modernist cooking (and a lot of molecular gastronomy) and a wild sense of imagination when it comes to his cuisine. Needless to say, I was very excited for this one – this would be one of those rare meals where I walked in expecting a meal that I would remember for a lifetime. It wouldn’t disappoint. 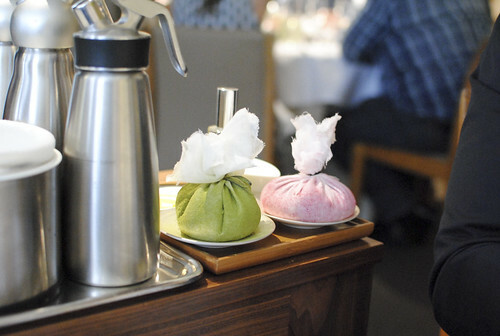 The Fat Duck is tasting menu only, around 14 courses for £180. 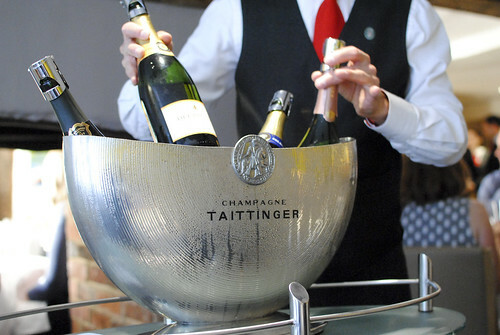 The first thing that came to our table was this trolley filled with cold champagnes. 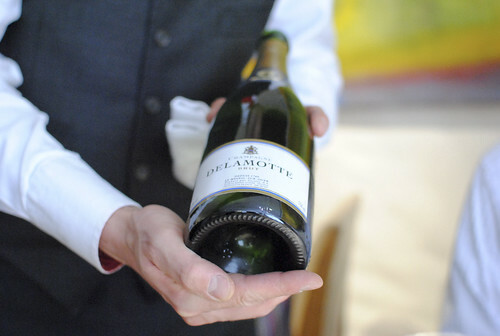 Dining at the Fat Duck seemed like a festive occasion in itself, so we kicked off the meal with a glass. 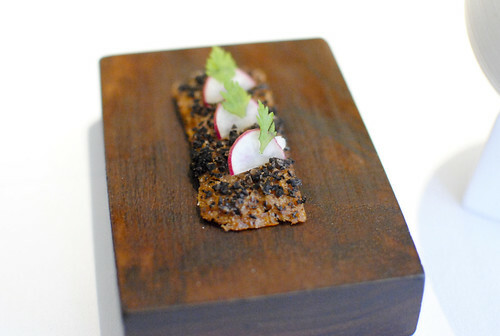 The first dish to hit our table was this amuse bouche. 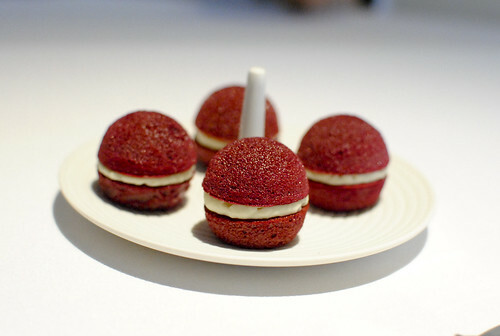 Looking kind of like a macaron (and having a texture similar to one), the shell exhibited a strong beet flavor, while a subtle spiciness crept up in the cream. Three choices of cocktail aperitifs came next. 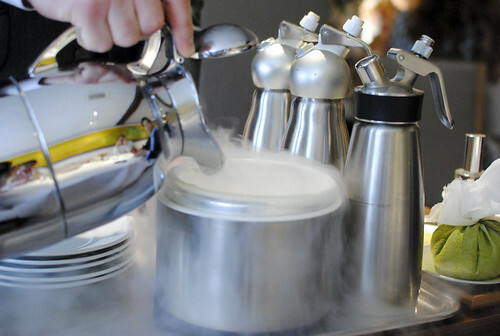 Some type of powder was frozen tableside with liquid nitrogen, resulting in a light and airy shell that melted once it hit my mouth. I had the campari soda and, indeed, it did taste pretty darn similar to the real thing. 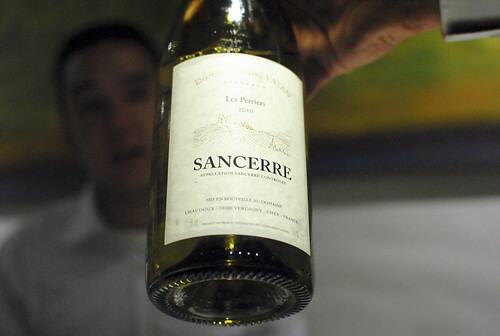 We decided to start with a lighter white and progress to something bolder later in the meal. 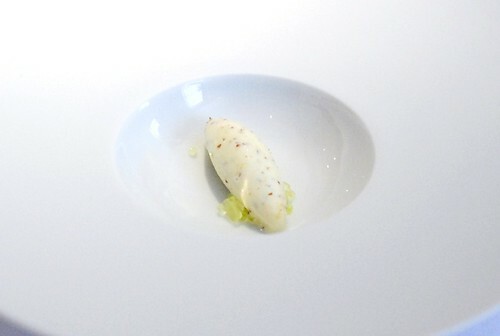 The mustard ice cream was the most pronounced flavor in this dish, which was both refreshing and mildly spicy. 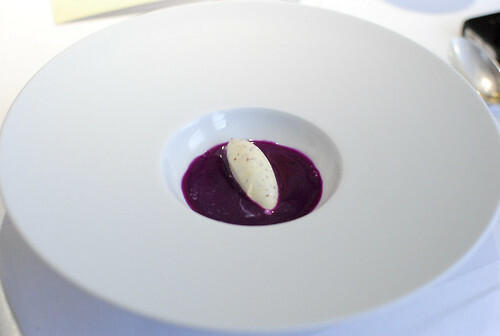 The red cabbage gazpacho itself was sweet, balancing out the ice cream nicely. 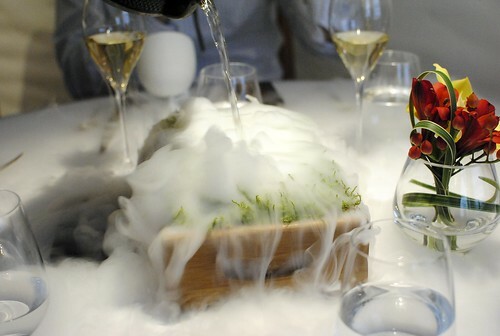 I had seen a picture of this dish ahead of the meal and was very curious how it all worked; it’s easily one of the most memorable presentations I’ve ever seen, resembling something like a foggy forest floor. Dry ice is hidden under the grass, and a dense fog billows out as water is poured over. 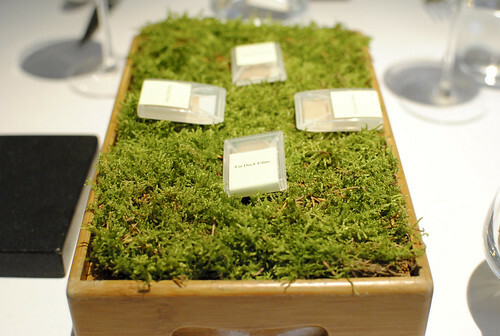 Food-wise, we started with a film that we placed on our tongue – the film gave off a smoky/woody essence on the palate. 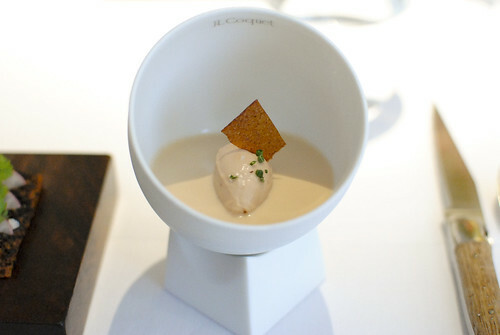 The two main edible components were the truffle toast and layered quail jelly, crayfish cream and chicken liver parfait. An odd combination of ingredients, but they worked well together to make some delicious savory bites. The porridge itself was tasty with a rich creaminess. 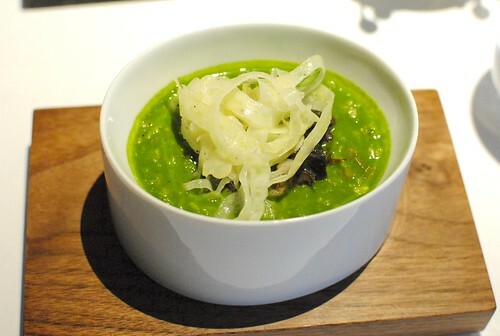 Tender chunks of escargot were a nice pairing too, as were the thin slivers of fennel. 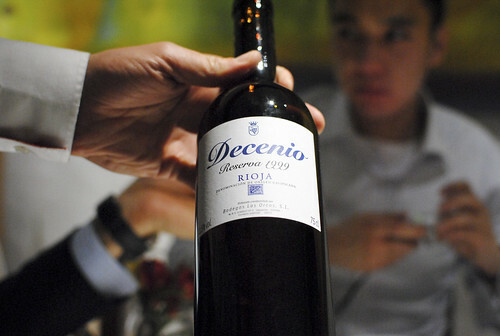 I didn’t think the jamon iberico was too pronounced though. 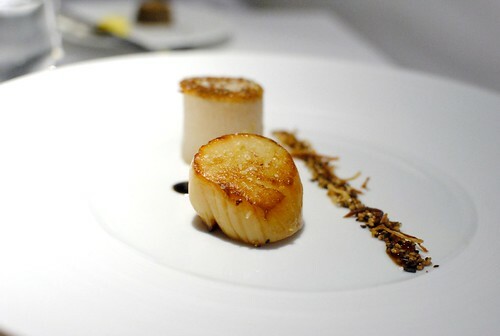 For the next dish, we had the option of the foie gras from the tasting menu or a special scallop dish that day. Three out of the four of us decided to stick with the foie gras. 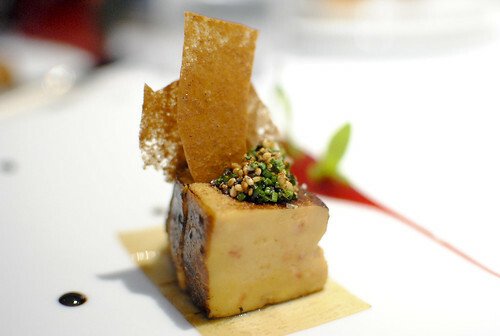 The foie gras itself was cooked perfectly, topped with a sweet fruity topping. It was good, but I thought the flavor profiles were a bit “typical,” especially considering our previous dishes. Our fourth did really enjoy his scallop, though. 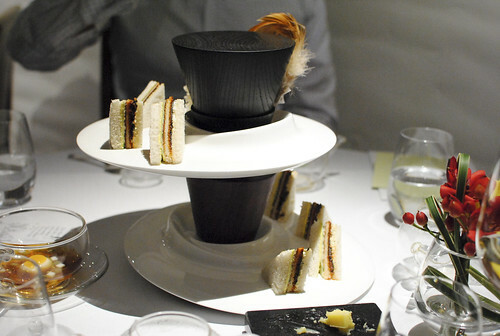 Our next dish brought back the whimsy with its tower of sandwiches and a teapot. 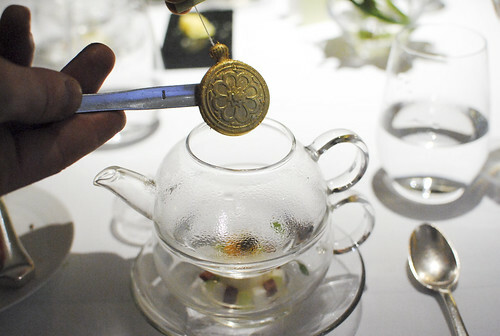 We were presented with gold pocket watches (presumably the Mad Hatter’s) which were placed into the teapot. We were instructed to stir gently and marveled at how the watch disintegrated and ended up turning the liquid into a sort of rich bouillon. Crazy. 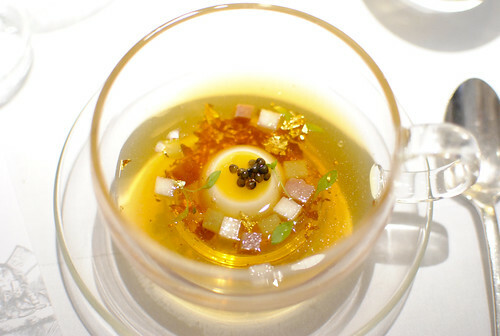 A quail egg and some caviar accompanied the delicious soup, which we ate with toast sandwiches….as in, crispy toast in between slices of bread. So cool, and tasty too. 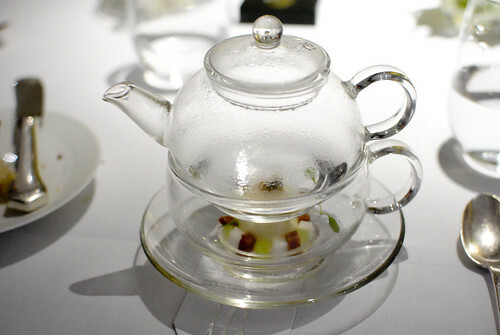 The assault on our senses continued as a sea shell was brought to our table. 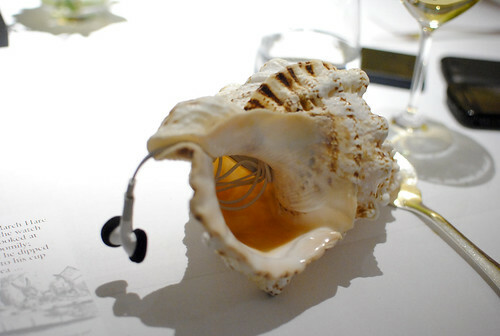 A small iPod was in each shell and we listened to sounds of the sea/beach as the next course came. 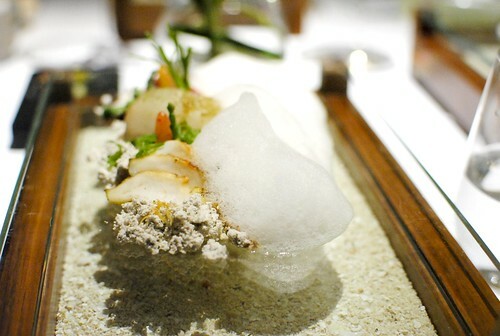 A selection of fresh sashimi including mackerel, halibut and cured abalone were accompanied by tapioca sand and a seawater foam. I can’t say for sure that the sounds elevated the flavors, but this was another fun dish. The fish was good, as was the strong sea flavor of the foam, and I found the texture of the tapioca sand to be addicting. Given I had flown in from Mumbai this morning (the 7:30 dinner began at midnight Mumbai time), I needed a bit of a pick-me-up. Three espressos definitely did the trick. 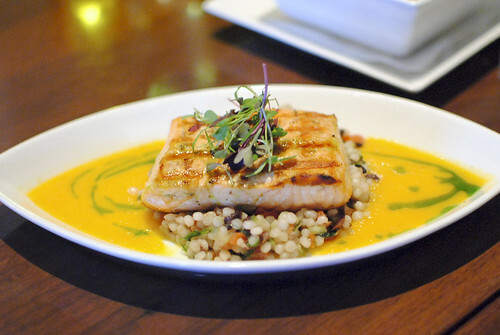 The poached salmon was cooked rare with a surprisingly subtle liquorice flavor. 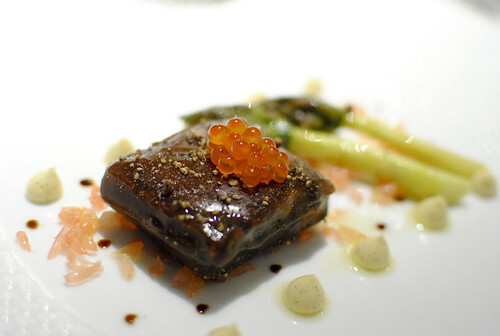 The salty trout roe and excellent asparagus may have overshadowed the salmon itself. Our last savory course involved the restaurant’s namesake ingredient (there had to be some kind of duck served in this meal right?). 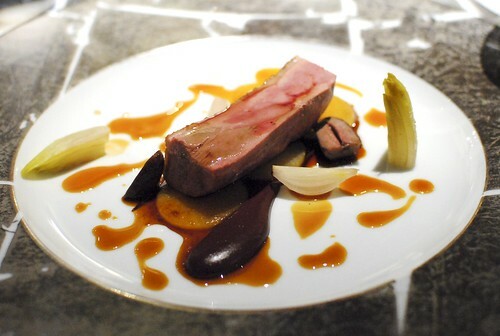 It was a tasty and succulent piece of duck breast, though the skin was disappointingly a bit limp. I enjoyed the potatoes and blood pudding though, and the duck spring roll was a fun way to present the duck, as well as provide texture. An intermezzo of sorts, I was very amused by this one. 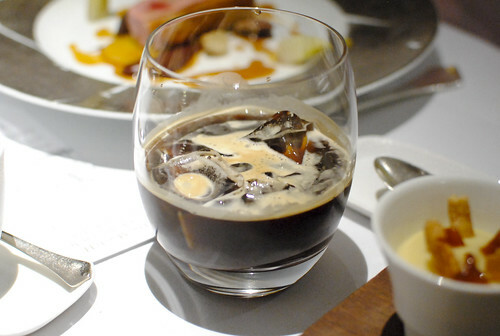 We were advised to drink this as soon as possible and were awarded with distinct warm and cold liquids. 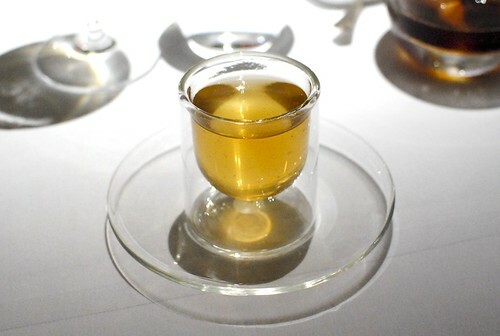 Aside from the playfulness, it was a good cup of tea too. 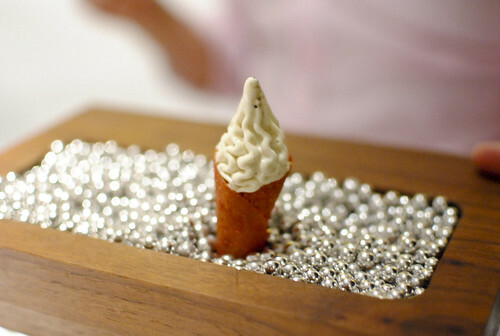 The first dessert was this creation – an earl grey ice cream cone followed by this macerated strawberry dish. 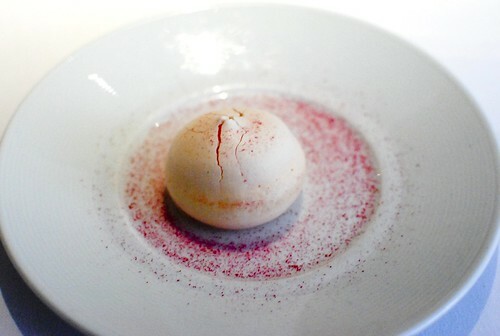 The strawberries were very sweet, balanced by a sort of savory olive oil biscuit. 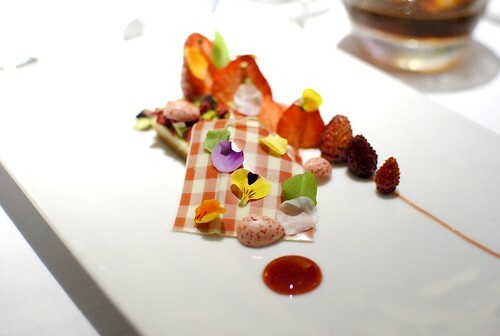 Everything on the plate was edible, including the picnic tablecloth look-a-like. We progressed into the richest and final dessert of the evening. 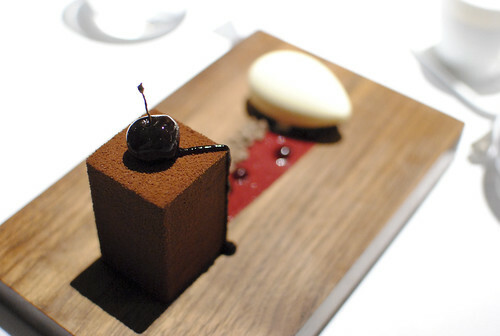 The server sprayed the aroma of “Black Forest” into the air just as we began to dig in. 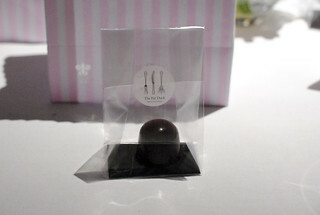 I can’t say the aroma consciously did much, but the gateau was a good one, with cherry and alcohol notes working in tandem with the chocolate. Chocolate crumble was crucial too in adding just a bit of crunch. 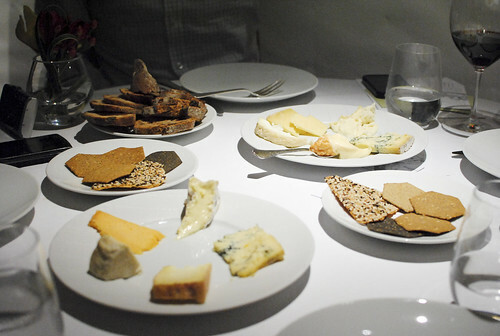 The cheese course supplement was a relatively reasonable £15 (given it was a generous portion); two in our party decided to partake. 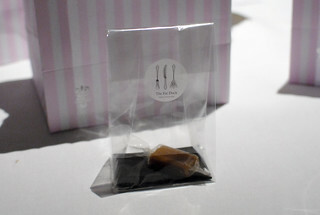 Next to arrive at the table were these gummies. SO cool! 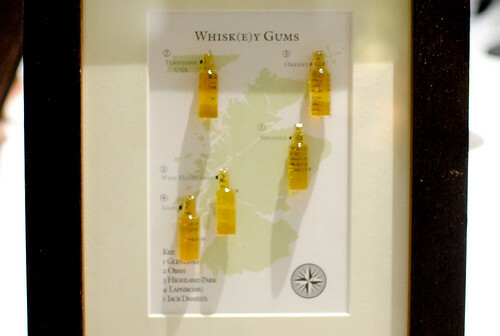 These were gummies of various whiskeys (reminded me of the Haribo happy-cola bottles) from around the world. They packed a punch too, having a strong whiskey flavor…as they should’ve. 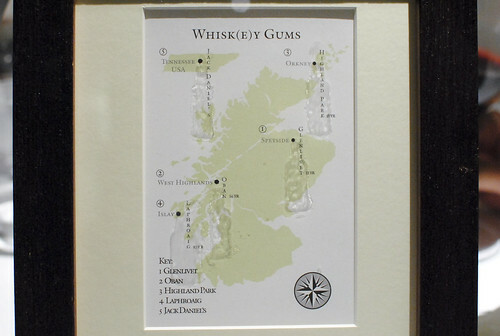 Maybe I was just pretty full or buzzed, but I had a difficult time distinguishing the nuances between the whiskeys. THE QUEEN OF HEARTS she made some tarts..
Lastly, we were left with a bag of sweets. 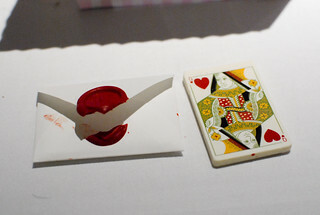 Of course, these were fun and whimsical too, particularly the pop tart-like Queen of Hearts. 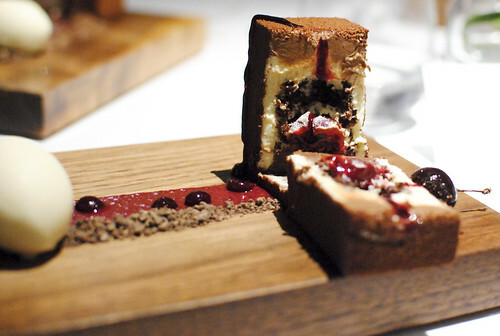 I do not hesitate in saying that this was one of the most (if not the most) unique and imaginative meal I’ve ever had. The creativity, the whimsy and the execution of these plates combined to make something pretty extraordinary. Having said that, when people ask if it’s the best meal I’ve ever eaten I don’t think I can say yes to that. While there were a number of delicious dishes, none of them made me think “this is one of the best things I’ve ever eaten.” Still, I thought the meal spanned a wide variety of ingredients and flavors, all of them working pretty well. This was an excellent all-around meal and easily one of the most memorable I’ve had; it’s surely a destination worth visiting when in London. Full picture set can be found here. After a heavy lunch at Holsteins, my parents and I were looking for somewhere to grab a very early dinner before our flights out of town. 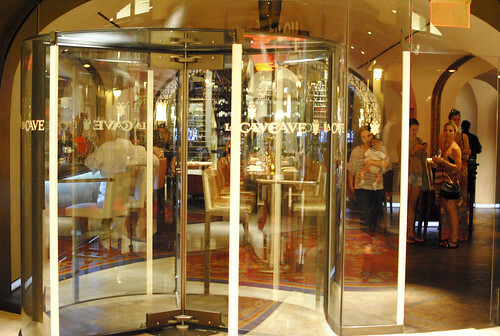 There aren’t a ton of options open in the 4-4:30 range, but we settled upon this casual dining restaurant at the Wynn. The place is a sort of blend between wine bar and small plates restaurant, and is one of the newer entrants to the Wynn lineup (opened at the end of 2010). 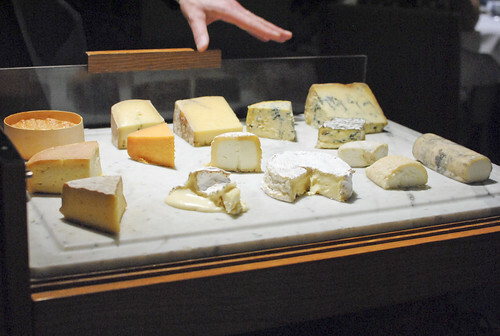 The menu is pretty varied, with sections broken out into items from the sea, the farm, the oven, the garden, the grill, the butcher (charcuterie), and the cow/sheep/goat (cheeses). Given neither of us were very hungry, so we stuck to some of the lighter fare. I thought this was nicely done. 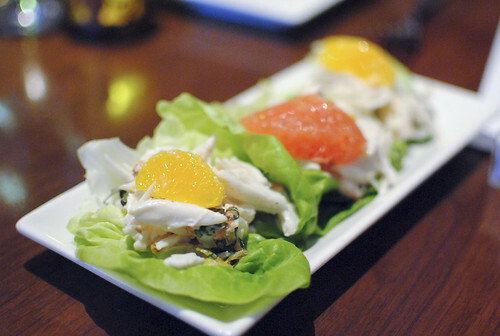 Sweet cool chunks of fresh crab sat in a crisp lettuce cup; a little bit of citrus went a long way too. Tasty and refreshing. This dish caught my mother’s eye. 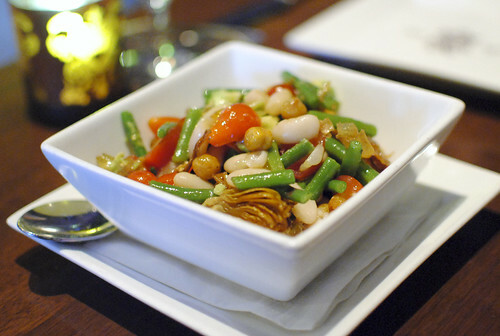 Creamy cannellini, waxy green and crunchy fried garbanzo beans were tossed in a light vinaigrette. 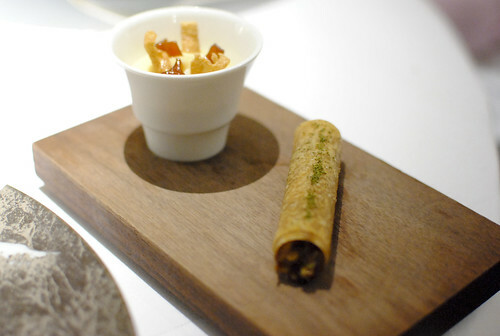 I thought the roasted artichokes provided a nice sweetness to the dish, while the textures kept things interesting. Another in the cool and refreshing category. 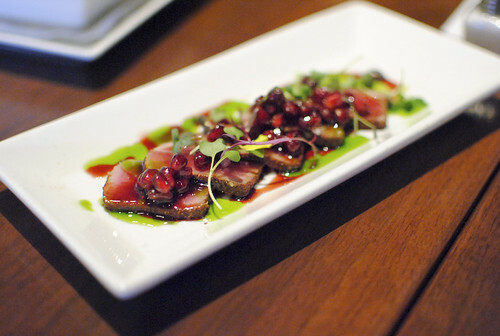 This seared ahi tuna rounded out our cold small plates. It was typical but solid, with the sweet pomegranate and basil oil complementing the tuna pretty well. I found the scallops to be nicely seared and cooked to a rare temperature in the interior. I couldn’t ask for more from them, but I wanted more flavor out of the polenta cake, which I found to be rather dense and bland. The salmon was a little bit overcooked and had a fishy flavor. Not good. The vegetable pasta was a fun element, with small pearls of various vegetables making a bed for the salmon. I found them to be a bit soft though, and could have used some textural crunch from some of the vegetables. Our meal at La Cave was okay. The restaurant isn’t particularly ambitious, seeking out to prepare approachable flavors at (relatively) reasonable prices. I suppose it does achieve this, there just wasn’t really anything memorable about it. Of course, it didn’t help that we weren’t that hungry at the time either. Recently, my friend Diana was craving a lobster roll. 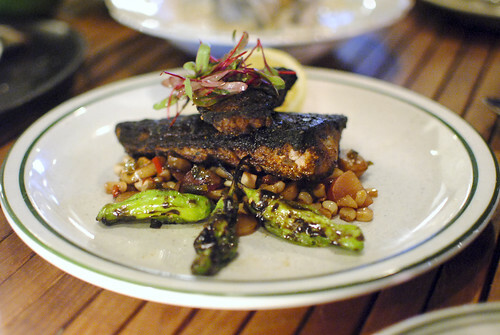 Rather then splurge on the $32 version at Water Grill, we wanted something a little more casual and reasonably priced in the area. L&E Oyster Bar came up and, while they don’t offer a lobster roll, the menu intrigued us enough that we decided to go. 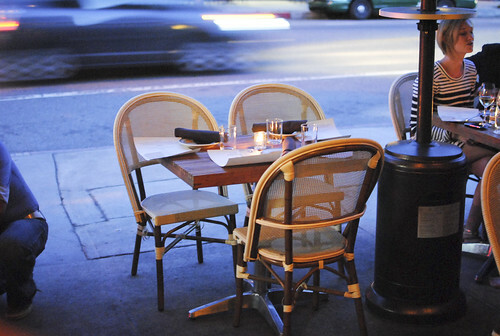 Yelp warned of long waits at the no-reservations spot in Silver Lake, and indeed it was pretty busy on a Tuesday evening. 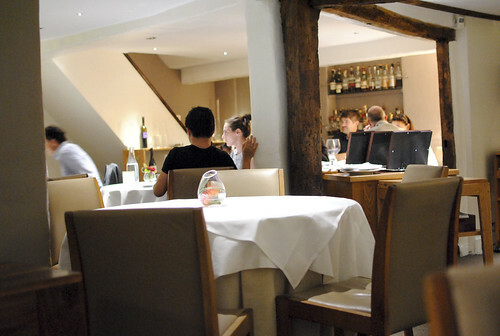 Our party of three got one of the last tables available, squeezing into a table for 2. True to its name, L&E Oyster Bar offers up a host of oyster options – there were 9 varieties of fresh oysters available the night we went. 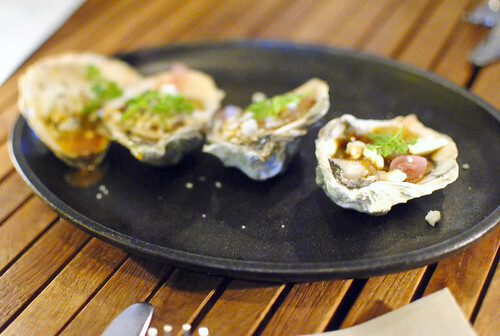 In terms of preparation, these oysters were served raw, grilled or fried with steamed and smoked options for other seafood. About 4 larger plates were available too. 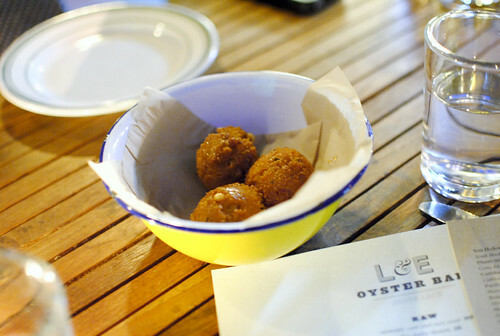 A complimentary ‘amuse’ came out of the kitchen – these fresh, hot hush puppies. There were two layers of sweetness between the cornbread and honey with a nice crispy exterior. A pretty good starter. Of course, we had to try some of the fresh oysters. 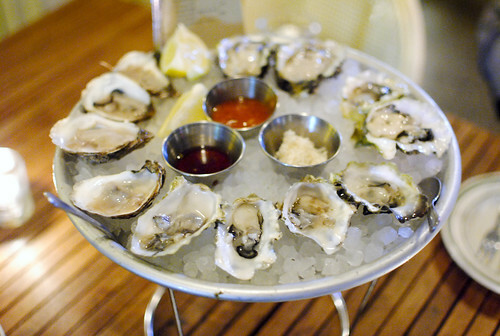 The daily dozen offered 4 pieces of 3 of the oyster options – ideal for sharing amongst the three of us. 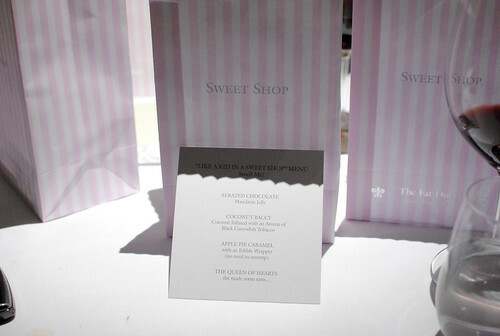 I enjoyed all 3 varieties, though had a hard time picking out the subtleties between them. 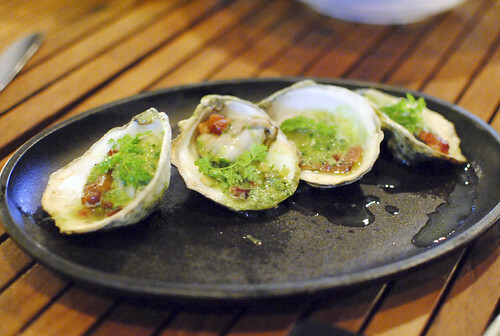 We also tried some grilled oysters on the shell; here, a classic oysters casino. I found the oyster to be cooked well, but there was a very strong grassy flavor that I found overpowering. I think it was parsley. We also tried one of the grilled specials of the day. I found this one to be much better balanced, flavor-wise with a bold chipotle BBQ-like sauce and some spicy notes coming through. 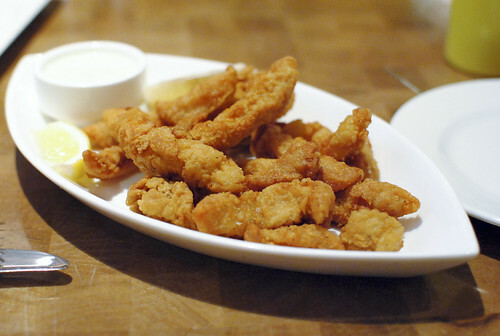 More cooked oysters – this time fried. 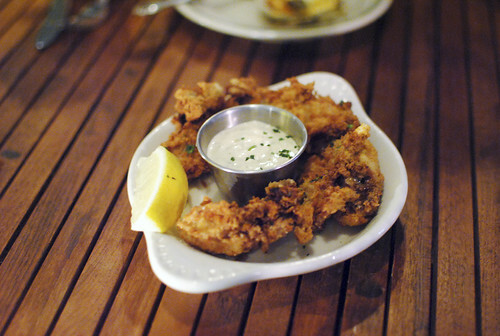 Simple and rather satisfying, the batter was light and crispy with plump tasty oysters on the inside. I thought this was a very strong bowl of clam chowder. It was rich and creamy with soft potatoes and a bunch of tasty clams; the smokiness of the bacon was present but not overpowering. 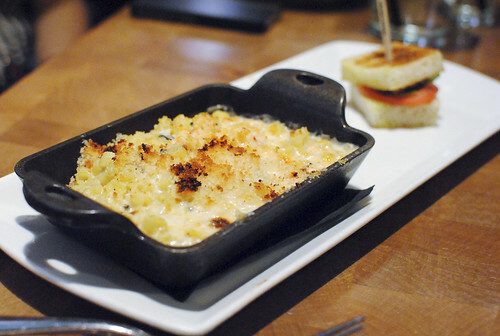 We also tried this rendition of a lobster macaroni & cheese. I had high hopes for it but thought it fell a bit short. I thought the lobster could’ve been better incorporated since I got the flavor from the piece sitting on top, but not in the interior of the dish. 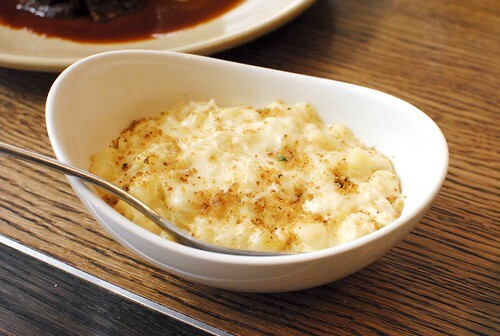 The spaetzle and cheese sauce itself were pretty good, though. This may have been the most disappointing dish of the night since the sea bass was flat out dry. The sweet corn succotash was a nice counter to the spices of the blackening seasoning, but it wasn’t enough to recover from the piece of overcooked fish. Boo. 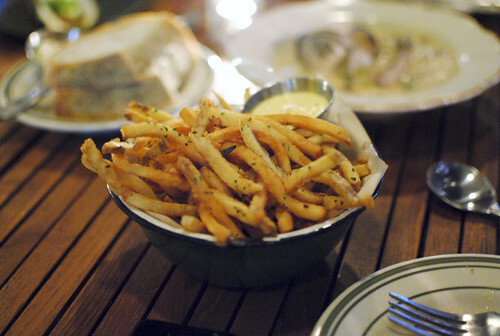 Lastly we had a side of fries, which was probably the most filling thing we had all evening. These were quite good – crunchy with a complementary herb flavor. 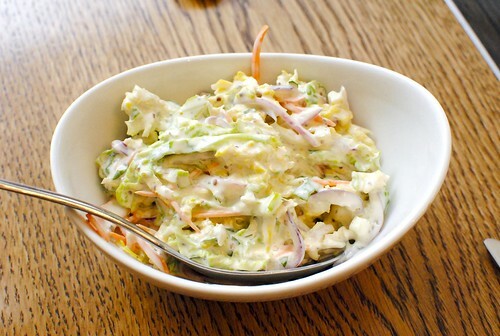 Perfect for dipping into the chowda’. 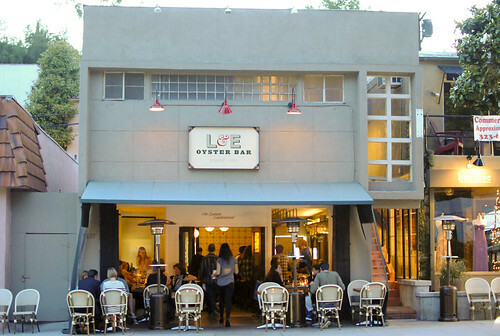 L&E Oyster Bar had its ups and downs but overall was somewhat of a disappointment. The quality of their oysters were definitely a strong point as expected, but the larger plates fell flat (lobster spaetzle and sea bass). Given the consistent crowds, I wonder if I was just there on an off-night or if I’m just missing something; regardless, I’m not in a hurry to return. 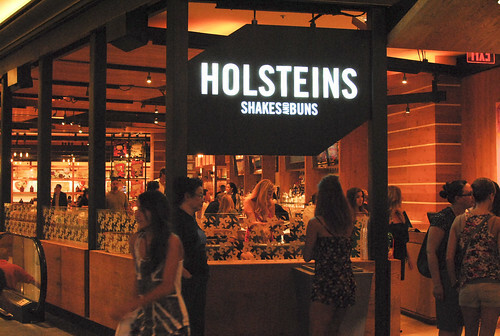 While looking for a lunch option after the Vegas Uncork’d Grand Tasting, I brought up Holsteins, something that would be casual and satisfying. 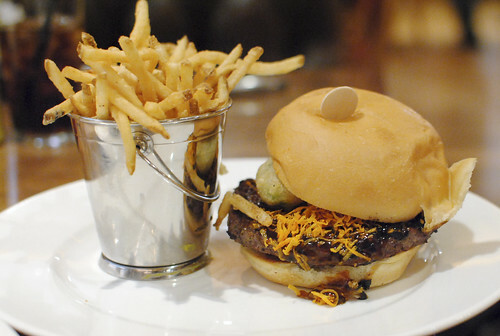 I’ve heard consistently good things about the restaurant, a burger joint inside the Cosmopolitan Hotel. My cousins, aunt and grandmother had yet to check out the new hotel, so a visit here would serve a dual purpose. 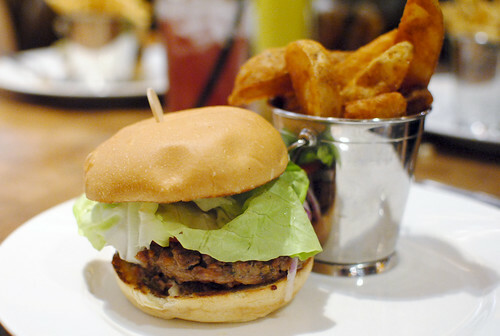 While there are a number of non-burger smaller plates and a few salads, the crux of the menu is definitely the burger. 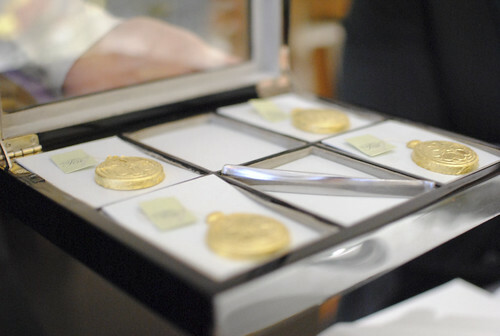 With about 15 different full-size options and 8 more slider-size options, the menu is quite varied. Some of them are pretty interesting. There’s even an option to add toppings such as lobster and BBQ beef brisket. Nice. A strong craft beer list and almost 20 milkshakes (alcoholic and non-alcoholic) boost the drinks menu, as if a burger and fries weren’t enough calories. We tried a couple of the appetizers and each ordered a burger. 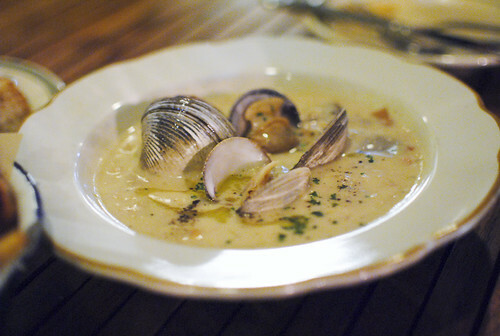 The clams were slight chewy and bready but definitely meaty and kinda juicy. Some of them were a little sandy though, which put me off. 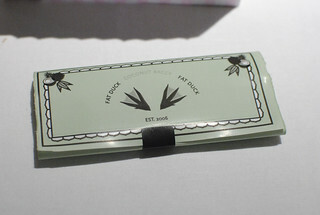 This sounded so decadent and I’d heard so much about it; it was a must order. 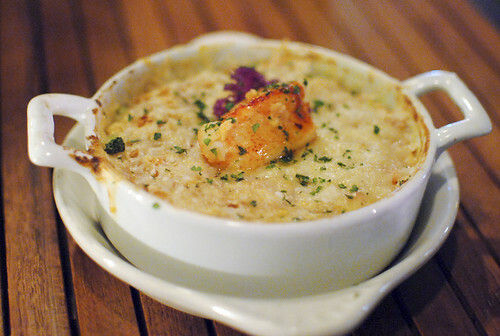 The macaroni had a nice chewy texture with small chunks of lobster in a creamy cheese sauce. 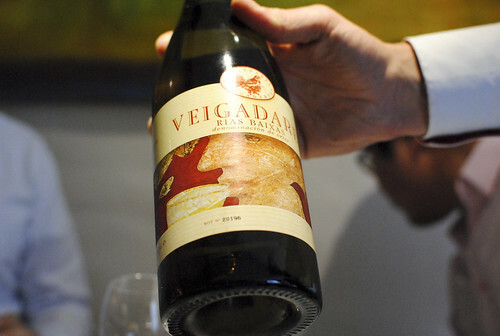 Not too rich – pretty good. I thought the truffle flavor was lost, however. My cousin went for this burger but I didn’t try it. 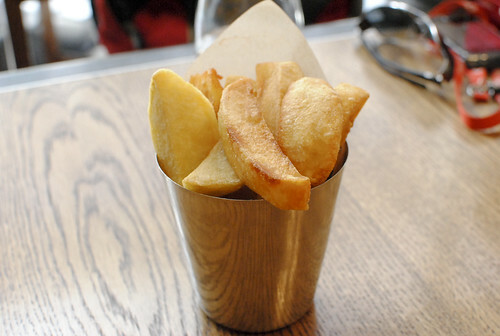 I did, however, sample some of the potato wedges/steak-cut fries and found them to be very good. Crispy on the outside and hot and fluffy on the inside. Mmm. My grandmother opted for this lamb burger. I found it kind of overcooked though I enjoyed the flavors of the lamb with Greek spices. 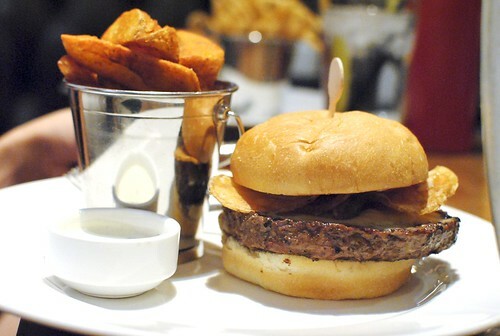 This was my favorite of the burgers and a damn good one. The teriyaki glaze provided a savory sweetness, while tempura avocado was crispy and creamy at the same time. Spicy mayo and nori furikake added some extra punch; there were a lot of flavors going on but I found them to be well-balanced. Excellent. Shoestring fries were good too, though my personal preference was with the thicker cut variety. 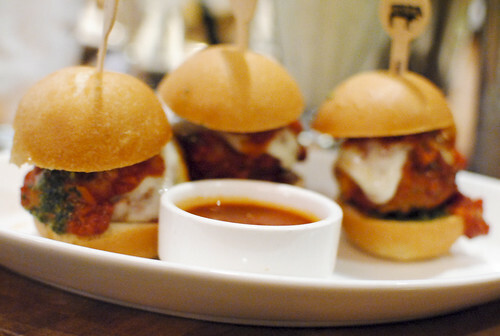 I had early dinner plans and wanted to try something a little bit different so I went with these meatball sliders. Each of the flavors were pretty distinct between the meat, provolone, peso and tomatoes; the sliders were good but nothing special altogether. I probably should’ve ordered something more exciting. 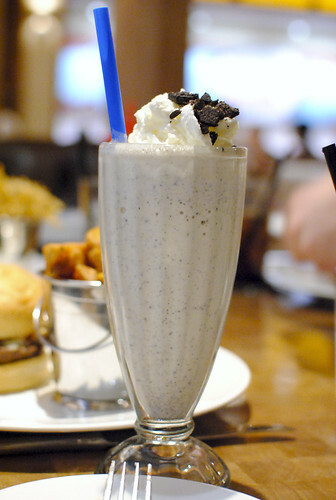 My cousin and I also tried a couple of milkshakes. I thought these were both strong with my favorite being the frozen grasshopper. 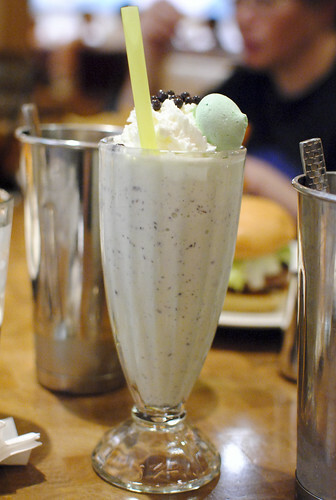 Like mint chip ice cream in a glass with a touch of alcohol. These were pretty generously sized (the glass was only 2/3 of it, with the rest in another cup) so definitely best for sharing…especially with a whole burger. I found Holsteins to be somewhat of an up-and-down meal. Strong points were definitely the Rising Sun burger, both french fry varieties and the milkshakes. The two smaller plates/appetizers we ordered weren’t bad but both fell slightly short. 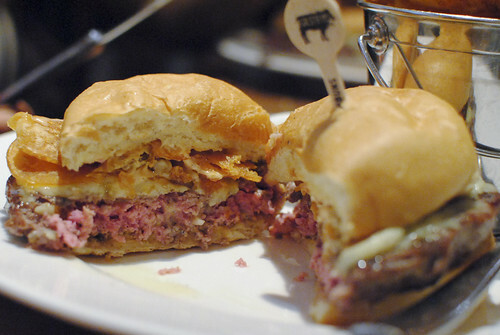 My main qualm was with the temperature of the burgers – we had at least one that was definitely overcooked here and a couple of burgers we ordered to-go on another visit (just two days ago) were clearly overcooked too (my Rising Sun, ordered medium-rare, showed no pink at all). For a burger place, I found a pervasive issue like this to be rather inexcusable. 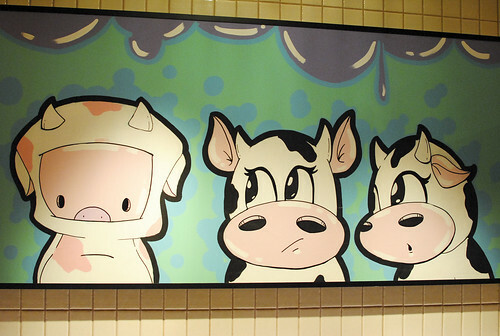 The restaurant mascot, a pig dressed as a cow, makes an appearance all over the place.